The annualized rate of new placements, representing the number of different children placed in the home, varied considerably across states, as seen in Table 3-3. Because homes with a very short time in foster parenting will appear to have very high new placement rates, homes in which the length of service was less than 90 days were excluded from this analysis. This restriction excluded 21 percent of homes in New Mexico, 14 percent of homes in Oklahoma, and 19 percent of homes in Oregon. The variations seen among different types of homes are similar to patterns seen when all homes were analyzed. Note: Table excludes homes where length of service was less than 90 days. New placement rates are similar for homes in Oklahoma and Oregon, but much higher in New Mexico. Since New Mexico's occupancy rates are similar to the other states, the difference in new placement rate may reflect shorter lengths of stay in foster care or higher rates of placement moves for these children. Similar patterns for license type and foster home locationwere seen across states. Within each state, foster parents with regular foster care licenses had higher new placement rates than did those with other types of licenses. Rural or nonmetropolitan homes had consistently higher rates of turnover than urban or metropolitan ones. 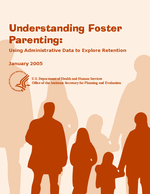 Variations by foster parent age and number of foster parents in the home were inconsistent. In New Mexico, older foster parents had substantially lower new placement rates than others, whereas differences among age groups were small for other states. New placement rates were highest for Native American foster parents in Oklahoma and for white foster parents in Oregon. Similar to the pattern seen for age, single-parent foster homes in New Mexico had higher turnover rates than two-parent homes, whereas differences were small for the other states. In Oregon, the rate of new placements was lower in homes where all foster parents work full time and in homes where income was greater than the median. Although these analyses do not allow examination of the relative contribution of foster parent characteristics to variations in placement rates, the large and consistent disparity by license type suggests that this may be the most significant factor. Regular foster care homes care for many more different children over time than do foster-adopt homes, restricted foster care homes, or therapeutic foster homes. When compared with the with occupancy rates in Table 3-2, this analysis suggests that differences in placement turnover may be far greater than differences in the number of children placed in a home at one time.